The battle between Tesla Inc. and General Motors Co. for the most valuable U.S. carmaker is heating up. After Tesla followed in the footsteps of the legacy automakers and announced a plan to cut jobs on Jan. 18, shares of the electric vehicle maker dropped as much as 10% in New York, bringing its market capitalization to just $54.2 billion. GM, whose shares gained as much as 0.6% Jan. 18, is now valued at $54.4 billion. If the outlooks from the two auto companies are anything to go by, GM looks set to be winning the race for the year. 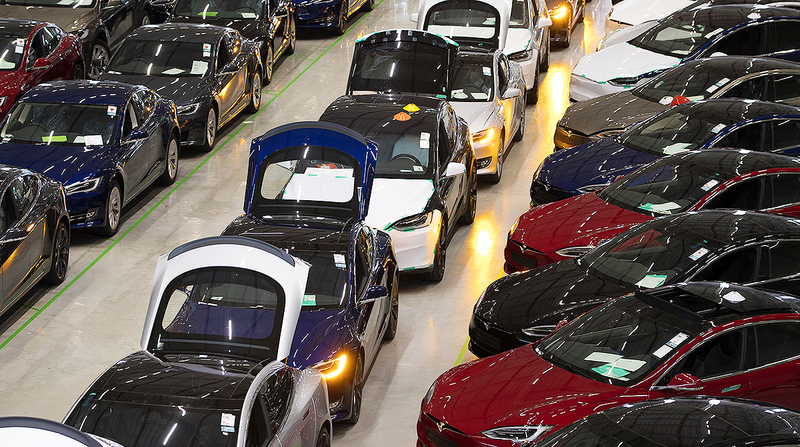 Tesla’s forecast of a “very difficult road” ahead, as it tries to ramp up the production of the lower-priced versions of the Model 3 sedan, contrasts starkly with the surprise outlook from GM earlier this month. The company, which was expected to warn about tough times due to a slowdown in auto markets in Europe and China, dismissed all concerns and forecast a strong profit, surprising investors. Despite going through a rough and turbulent year as a company, Tesla shares managed to gain about 7% in 2018, mostly helped by strong deliveries and profit for the third quarter, while GM’s stock dropped more than 18%. The trend has been reversed so far this year, with Tesla dropping 5.6% and GM rising nearly 15%. Still, the U.S. peers are valued at a fraction of the global heavyweight, Toyota Motor Corp. The Japanese carmaker’s market cap sits at 22.2 trillion yen, or $202.8 billion.